The main research problem I am trying to solve relates to one of the reasons for the lack of progress of 21st Century medicine - the world collectively still relies on 19th Century mathematics to analyse the large datasets they generate. My work is contributing to expanding the state-of-the-art computational and mathematical methods that can transform large volumes of data into useful knowledge. With more sophisticated methods we can generate new working hypotheses and lead to breakthroughs. Our work provides new analytical methodologies to unleash the full potential that 21st Century biotechnologies can give us to improve human health. My family’s favorite story is that at the age of 5 I challenged my first grade teacher in a Catholic school to explain how Darwin’s Theory of Evolution fits with her storytelling about Adam and Eve. My parents were quickly summoned to explain how I knew that and they say “We do not know, he may be reading something at home” so I guess that research has always been a part of my character. I have been working in a field called ‘Evolutionary Computation’ for the past 30 years. We use mathematical procedures (algorithms) that evolve solutions of challenging problems using computers. In true a ‘Darwinian sense’, many solutions for a problem of interest are created, and they ‘live’ and ‘die’ inside the computer. We apply these novel algorithms for hard questions in medical research and they help us to find interesting patterns that could have been completed missed if less sophisticated methods are used. It is a highly interdisciplinary field, hugely satisfying from an intellectual perspective and extremely powerful in practice. I dream of a more efficient medical research enterprise and more effective medicine. I see medical research lagging behind other fields in terms of the optimal utilisation of 21st century technologies. These technologies include computer science and mathematical methods that drive more efficient, successful and innovative medical developments. The ultimate goal is that we will move towards a more efficient and quantitative approach to diagnosing and also preventing disease. Ideally, I would like our health systems to be efficient, proactive, predictive and personal, with a life-long follow-up that helps to circumvent avoidable diseases. 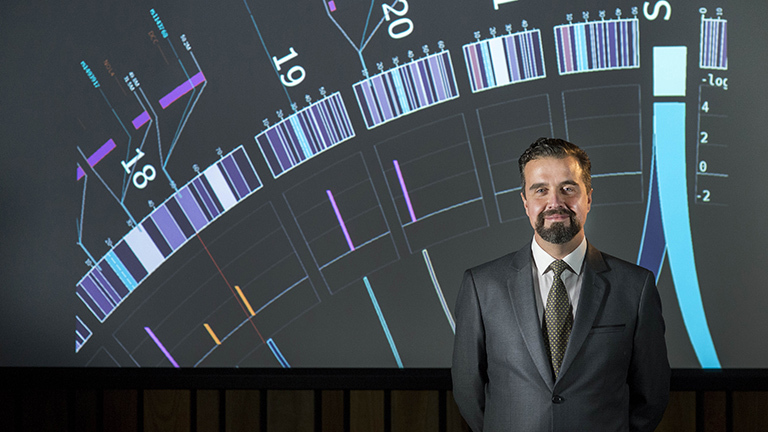 Professor Pablo Moscato aims to use advanced computer modelling and mathematical algorithms to detect patterns and predict outcomes in large biological datasets. In doing so, computer scientists like Professor Moscato are able to work towards personalised medicine which focuses on providing individualised treatment regimens for patients with different needs. Using genetic and biomedical samples of patients, likely biomarkers for diseases are able to be identified and the most appropriate and effective treatments can be applied. Professor Moscato obtained his Bachelor of Science degree from the University of La Plata in Argentina before completing a PhD at the University of Campinas in Brazil. During a postdoctoral position at the California Institute of Technology, he developed a new methodology called ‘memetic algorithms’ which is now widely used around the world. Professor Moscato has made several key advances in personalised medicine over the past 27 years of his career including identifying important biomarkers and hallmarks of cancer and epilepsy. He has also identified gene expression maps for multiple sclerosis and developed algorithms for successfully discovering biomarkers for Alzheimer’s disease with high accuracy for predicting the onset of the disease, which was previously thought to be a disease somewhat precarious to predict. By using computer profiling and mathematical modelling, Professor Moscato has been working to transform the ways in which biological data is handled and has even developed new methods of tracking the progression of cancer and Alzheimer’s disease in the brains of patients. Professor Moscato has won several prestigious awards including the best paper award at the First European Workshop in Evolutionary Computation and Bioinformatics and has also been an invited keynote speaker at numerous scientific conferences including the Metaheuristics International Conference in Singapore and the Congress of the Chilean Institute of Operations Research in 2011. He has successfully supervised more than 13 PhD candidates to completion and is currently supervising another 12 candidates enrolled at the University of Newcastle. Professor Moscato has also gained more than $11 million in project grant funding over the past 15 years. Professor Pablo Moscato is an Australian Research Council (ARC) Future Fellow and Founding Director of the University of Newcastle’s Priority Research Centre (PRC) for Bioinformatics, Biomarker Discovery and Information-Based Medicine and also the Newcastle Bioinformatics Initiative. Elected Member of Council of The University of Newcastle. Founding Director – Centre for Bioinformatics, Biomarker Discovery and Information-based Medicine. Could a blood test for the early detection of Alzheimer’s be on the horizon?